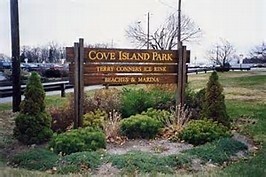 TERRY CONNERS RINK at 1125 Cove Road located in Cove Island Park, Stamford, Connecticut. Cove Island Park is on the corner of Cove Road and Weed Ave. See Map. From Northbound: (from Greenwich, New York area) Take exit 9 off I-95. At the end of the ramp take a right onto Seaside Ave. At the end of Seaside Ave. take a left onto Cove Road. At the end of Cove Road turn right into Cove Island Park. From Southbound: (from New Haven, Bridgeport area) Take exit 9 off I-95. At the end of the ramp take a left onto East Main St. At the third traffic light take a right onto Weed Ave. At the end of Weed Ave. turn left into Cove Island Park. From Merritt Parkway (Rt. 15) Take exit 36, at end of ramp head towards Stamford onto Rt. 106 (Hoyt St.). Follow Rt. 106 and take a left onto Courtland Ave. At end of Courtland Ave. take a left onto Main Street (you will be by the I-95 entrance ramps). At fourth traffic light take a right onto Weed Ave. At the end of Weed Ave. take a left into Cove Island Park.